So, I’ve neglected my writing for months…lost my mojo with it, so to speak. It happens sometimes – often for no good reason – but in this instance it’s because I’ve just gone through a difficult relocation. So. Moving then. Why do we do it? Good question. And one I have asked myself a thousand times since we left Kings Hill six weeks ago. The warm, comforting, slouchy familiarity; the ease of communication with good neighbours – many of whom became sincere friends – has been replaced by a hyper-attentive, watchful hope, as I search nameless faces with one thought – could you be a friend? Thing is, wherever you go, most people are decent enough. Open, kind, receptive. I mean, not everyone – I didn’t move to Disneyland or anything…although come to think of it, Disneyland has some pretty rotten apples so scratch that comparison, but you get my drift. Being a serial mover, this is all familiar territory to me – that ‘ick feeling in the pit of my stomach as I walk around the local park with Brodie, hoping that people will think we’re worthy of a wave and a hello and eventually maybe a coffee, or a glass of wine. It’s early days, but the signs are good. I’m a friendly person, which surely must count for something, no? As sad as we were to leave behind our friends in Kings Hill (understatement of the year, I wept buckets in my last week there), we came to the cathedral City of Chichester because we liked the buzz and the giddying array of shops, cafes, bars and restaurants, as well as the galleries, and the fabulous theatre (which I’m told acts as a crash-test for many West End shows). It’s close to the majestic South Downs national park and the sunny South Coast is nearby. I’ll probably swerve Bogner because it’s busy and commercial, but I’ve already fallen for Selsey East Beach (a rustic, quirky version of the Hamptons), posh West Wittering, and lovely Pagham. 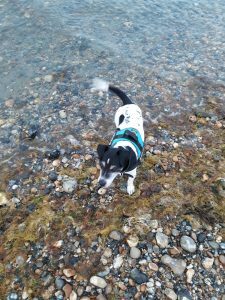 The former has been a source of joy and happiness as all three of us have swum in the sea there; Brodie’s little paws scooping like billy-o when I thought he was afraid of water brought tears to my eyes. The house we’ve bought is a whole other subject. It’s big, detached, and surprisingly dated and rundown for its tender teenage years. But like people, houses respond to love and attention, and Mark and I intend to lavish both upon it. On that note, I’ll close on a story that a lovely friend whom I don’t see anymore (because I moved away) told me (Nigel: I’ve always remembered this tale, as I remember you – with affection). ‘What were they like in the place you’ve come from?’ the farmer said, answering a question with a question. Gutted, the traveller trudged on his way, and the farmer returned to his work. ‘What are the people like here?’ he asked. ‘What were they like where you’ve travelled from?’ replied the farmer once more. Wishing you all an awesome August – wherever you are in the world.